South Africa's governing African National Congress (ANC) is preparing for a leadership contest which could decide whether it will reinforce the pattern of Africa's well-documented post-colonial failures or break away from a dark past into a bright future for Africa's largest economy. The stakes could not be higher for President Jacob Zuma - he is up for re-election at the conference in Mangaung, where the ANC was founded 100 years ago. With the ANC's huge majority in South Africa, whoever leads the party is virtually assured of leading the country after the 2014 elections. In 2007 President Zuma was catapulted into the top job at the previous such conference, in Polokwane, when he ousted his long-term friend and comrade, then-President Thabo Mbeki in a humiliating defeat by a majority of 61% to 39%. Since the ANC opened nominations on 1 October, those who support a second term for President Zuma seem to be in the majority compared to those who support his much loved but somewhat reserved deputy Kgalema Motlanthe - the only other candidate. President Zuma's successes in his first term have been partially overshadowed recently by the Marikana massacre, when 34 striking miners were shot dead by police during a bloody pay dispute at the Lonmin platinum mine on 16 August - the most deadly police action since the end of apartheid. His critics say that President Zuma's lethargic style of leadership is fuelling the decline of his ANC and the economy, which is struggling to maintain growth rates enjoyed elsewhere on the continent. Another dark cloud hanging over Mr Zuma, sometimes referred to by his clan name Msholozi, is his alleged use of public money to fund a multi-million dollar renovation at his private rural homestead in Nkandla. Public Protector Thuli Madonsela is investigating whether a government department is funding home improvements amounting to 248m rand ($28m), at a time when miners are fighting to earn a salary of 12,500 rand ($1,400) per month. Reports in local newspapers said the building costs include a clinic, helicopter pad and underground bunkers amongst other facilities. Mr Zuma denies any wrongdoing, saying he took out a mortgage for the development. Another charge which may affect President Zuma's support in Mangaung is that of widespread corruption. There is a perception that under his leadership, corruption is on the rise and that his family is benefiting from nepotism by getting business deals purely because they are related to the president. His old friend turned political foe Mr Mbeki broke a four-year silence when he launched a scathing attack on Mr Zuma's lacklustre leadership style, saying he was "deeply troubled by a feeling of great unease that our beloved motherland is losing its sense of direction, and that we are allowing ourselves to progress towards a costly disaster of a protracted and endemic general crisis". Mr Mbeki continued: "I, for one, am not certain about where our country and nation will be tomorrow, and what I should do in this regard, to respond to what is obviously a dangerous and unacceptable situation of directionless and unguided national drift." President Zuma's greatest challenge does not come from the opposition benches of parliament, it comes from within. Mr Motlanthe, 63, is a quiet, popular former political prisoner who is a rather reluctant presidential candidate. A former trade unionist in the National Union of Mineworkers (NUM), he served as president for six months in 2008-9 after Mr Mbeki was recalled by a divided ANC. "The harsher that judgement is, the better for the ANC. We ought to hear the truth as painful as it is and take steps to address the basis of those concerns," he told the Newsday programme. "If we fail to stay on our toes because of the cries of the people, then we don't deserve deserve to hold these positions of responsibility." Unlike Mr Zuma, who usually breaks into song and dance on podiums across the country, Mr Motlanthe is a very private and restrained man. He has been nominated for the top job by most branches in South Africa's richest province, Gauteng, while those in six of the nine provinces have backed Mr Zuma. He recently told journalists he was "agonising" over whether to challenge Mr Zuma. Mr Motlanthe is supported by the expelled firebrand ANC Youth League leader Julius Malema, although the deputy president sought to downplay this, pointing out that the Youth League only had 45 votes in the Mangaung conference and so "is not a king-maker". Mr Motlanthe does not want South Africa's rich mines to be nationalised, as Mr Malema has been demanding. If he decides to take on Mr Zuma and wins, he could breathe new life into the ANC. If he loses that would end his career in the party. But by failing to quash the speculation, it looks as though he may already have signed his political death warrant. The pro-Zuma factions have now nominated Mr Motlanthe's former comrade in the National Union of Mineworkers, veteran of the anti-apartheid struggle and businessman Cyril Ramaphosa, for deputy leader. He has 65% of the nominations so far but this could change before the Mangaung conference. If Mr Ramaphosa accepts the nomination and wins, Mr Motlanthe would lose his position in the party leadership. During the Marikana dispute, Mr Ramaphosa was criticised by some for his links to Lonmin but he remains popular in the business community and his nomination shows he has not lost his support within the ANC. For Mr Motlanthe, who is described in Ebrahim Harvey's book Kgalema Motlanthe, A Political Biography, as a quiet man, a deep thinker, it is decision time. But what would Mr Motlanthe do differently from Mr Zuma if elected? First and foremost, some say he would bring dignity to the highest office in the land, in contrast to the lurid headlines about the polygamous Mr Zuma's private life. In the ANC, leaders can only bring their individual style but very little substance, purely because policy decisions are taken by the collective and therefore no leader can introduce policies that were not discussed at the ANC headquarters in Luthuli House. So why does Mr Zuma remain the favourite to win? He is a populist, good with crowds and with some noted success in the fight against HIV and Aids, getting South Africa recognised as one of the Brics group of developing nation (joining Brazil, Russia, India and China), getting his ex-wife and former Former Minister Nkosazana Dlamini-Zuma elected as chairperson of the African Union commission. Under President Zuma, 70, also a former Robben Island prisoner, the HIV infection rates have drastically come down and he is currently overseeing the largest HIV/Aids treatment programme on the planet. But more than 18 years after the end of apartheid, Nelson Mandela's "Rainbow Nation", has clearly come to the end of its honeymoon period. Can the beloved ANC of Madiba - the clan name used to refer to Mr Mandela - survive in the hands of the man from Nkandla? Some in the ANC believe that if Mr Zuma continues to lead for another term which translates into seven years, including a five-year presidential term, then it could prove to be the beginning of the party's demise. South Africa's President Jacob Zuma has appealed to his ancestors to help him hold on to the leadership of the ruling African National Congress (ANC). Mr Zuma attended a ceremony at his village on Sunday, where 12 cattle were slaughtered and incense burnt as people prayed for his re-election. His opponents are pushing for him to be ousted as ANC leader at the party's conference next month. Mr Zuma, a polygamist with 21 children, is a well-known Zulu traditionalist. He beat his predecessor Thabo Mbeki in a bitterly contested election in 2007 for the leadership of the ANC. He later forced Mr Mbeki to resign as South Africa's president, installing Kgalema Motlanthe as caretaker leader until the 2009 general election, when he took power. The ANC's influential youth wing and several government ministers are now campaigning for Mr Motlanthe, the deputy president, to run against Mr Zuma at the ANC conference in Mangaung next month. The Zuma family slaughtered 12 cattle and burnt incense at a traditional ceremony at their village in Nkandla in KwaZulu-Natal province on Sunday to appeal to the ancestors to guide him ahead of the elections. "We are here to give our father a send-off to Mangaung. With this ceremony we are now sure he is protected and he will come back to celebrate with us," Nomthandazo Zuma is quoted by South Africa's The Mercury newspaper as saying. Traditional leader Inkosi Bheki Zuma gave the president, who was dressed in leopard skins, a Zulu spear and shield and told him to use the weapons to protect himself from his ANC opponents, the newspaper reports. Mr Zuma has been dogged by corruption allegations throughout his term, but he is expected to be re-elected as ANC leader, analysts say. South Africa's Auditor-General Terence Nombembe and Public Protector Thuli Madonsela are investigating whether taxpayers' money has been improperly used to upgrade Mr Zuma's residential complex in Nkandla, reportedly at a cost of about $27m (£17m). It includes chalets, a security bunker, and bulletproof windows. Earlier this month, Mr Zuma - who has four wives and 21 children - said he taken out a mortgage to pay for the renovations and he objected to being "convicted, painted black, called the first-class corrupt man, on facts that are not tested". The National Prosecuting Authority (NPA) dropped corruption charges against Mr Zuma shortly before his election as president in 2009. He was accused of taking bribes from an arms company and his financial adviser Schabir Shaik - allegations he strongly denied. Earlier this year, Mr Zuma's government unveiled The Traditional Courts Bill which would allow local chiefs to act as judge, prosecutor and mediator, with no legal representation and no right of appeal in certain cases. It has been widely criticised for being unconstitutional, especially by women's groups, which argue it would take South Africa "back to the dark ages". But Mr Zuma says the legislation will help "solve African problems the African way, not the white man's way". South African President Jacob Zuma has accepted a Constitutional Court judgment declaring that it was unconstitutional for him to extend now-outgoing Chief Justice Sandile Ngcobo's term of office. 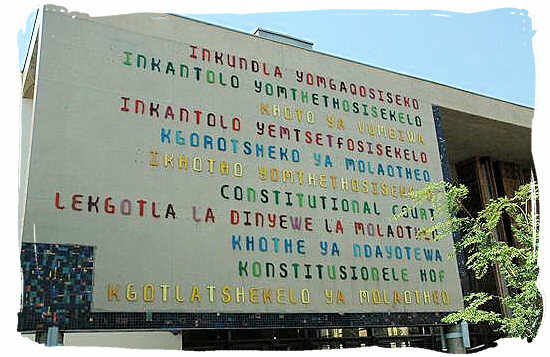 The press release issued from the office of the South African presidency detailed that," The Presidency accepts and respects the judgement of the Constitutional Court in relation to the unconstitutionality and invalidity of Section 8 (a) of the Judges' Remuneration and Conditions of Employment Act of 2001 and will abide by it. The law was valid until today's judgement, and government will now study the ruling to see what directives the Constitutional Court is giving to Parliament for remedial action. vThe President has begun the process of appointing a new Chief Justice and will do so in accordance with the provisions outlined in the Constitution of the Republic." A South African newspaper reported that, " The Constitutional Court on Friday ruled that it was unconstitutional for President Jacob Zuma to extend now-outgoing Chief Justice Sandile Ngcobo's term of office. The judgment was unanimous. The court declared Section 8a of the Judges Remuneration and Conditions of Employment Act -- in terms of which Zuma extended Ngcobo's term -- unconstitutional. The court found that the section allowed the president to "usurp" the power of Parliament and held that Parliament alone had the power to extend a Constitutional Court judge's term of office. Zuma and the Justice Minister were ordered to pay costs. It was announced on Wednesday that Ngcobo had decided to withdraw his acceptance of Zuma's extension, which leaves the post of chief justice open from August 15 should a replacement not be found by then. The application against the way Zuma offered Ngcobo an extended term was brought by the Council for the Advancement of the SA Constitution, Freedom under Law, the Justice Alliance of SA and the Centre for Applied Legal Studies."